Came across this real cool image while surfing the www some days ago. Unfortunately as you will see this is an image that is "owned" by a picture company who placed their logo across. OK, there is no way to get this pic for free without the logo (actually there might be eventually) but I share this still as this is to cool to stay hidden in an archive. Whats cool with this picture? 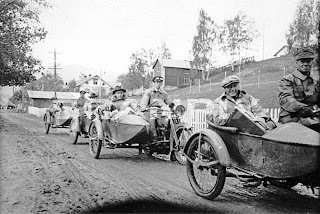 Its because our previous King Olav (then Prince) is passenger in the first sidecar outfit. These smiling young chaps are on their way home after having spent the weekend hunting at the Kings cottage Sikkilsdalen. There are hunting dogs in all three sidecars behind the bike where Olav is passenger. Picture is taken in 1924. All bikes in the picture are Harley Davidsons from late teens / early twenties.